If you are looking for neoprene waders you likely plan on fishing in colder areas or need something durable for duck hunting. Neoprene can keep you warm for longer than most of the breathable waders ever could. For around 70 $ the Caddis Neoprene Stockingfoot Waders are fairly cheap, I will review them for you to check if they are worth buying. While being more enduring than breathable material, neoprene is also heavier. I was surprised by how light the Caddis are. Folded up they take barely any more room than my standard pair of breathable waders and therefore are easy to transport and store. The quality of the seams could be better, you can tell that right away, just by looking at them. In this price range, you can’t expect them to be sound welded, high end, four times taped and six times glued but I would have hoped for more here. Actually the seams at the hand warmer pocket, where you have to remove some piece of tape when you first get them, already look like they would leak right from the beginning. Luckily these seams do not really matter. Apparently sizing is a bit off. I ordered my regular size and they definitely felt too tight especially around the thighs. Since I usually never have a problem with sizing, I would recommend ordering one size bigger than you usually wear for the Caddis. So far I was able to test them three times in action in form of regular river fly fishing and they worked as intended. I did not freeze at all, the temperature in them was comfortable and most importantly they did not leak, I stayed dry. As already said the size I ordered was slightly too tight and therefore limited my flexibility a little bit. Not really an argument against the though, just order the right size and you should not have problems. The Caddis come with reinforced knees, which is certainly a plus. 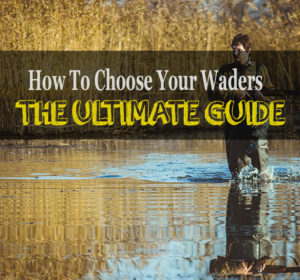 If you kneel a lot or move through brushes while hunting this will extend the longevity of a pair of waders. Sharp rocks or sticks can tear up waders surprisingly fast. With reinforced knees, you just have to be less careful which is pleasant if you do not plan on going easy on them. As already mentioned, they come with fleece lined handwarmer pockets, which is always nice to have, particularly on colder days. You do not want cold hands to limit the time on the water and in my opinion gloves are annoying. Suspenders are adjustable and are secured by velcro which holds them solidly in place. The Caddis come with two D-rings where you could attach shell holders or -what i usually do- line clippers. The neoprene booties are taped on the in and outside and gravel guards are included. What I am missing here once again, are belt loops and a wading belt, so if you do not have one get one right away, no excuses! If you have realistic expectations what you get for 70$, you won’t be disappointed. The Caddis will certainly support you for the season of duck hunting or if cold weather can’t prevent you from going fishing. They are entry level equipment and you get what you pay for. If you are looking for something, that will last longer than one season, take a look at my Frogg Toggs Amphib review, but in this price range, you won’t find better neoprene chest waders.